With the emergence of trends such Converged Infrastructure (CI) and migration to colocation data centers, we’re seeing more customers looking for solutions that deliver fully populated IT cabinets – whether it be to the customer site or to a colocation. In many cases, the end user will work with a reseller or integrator that helps specify and configure a completed IT cabinet. When it comes time for the build out, the enclosure and equipment are shipped to the integrator’s site where they “rack and stack” the customer’s IT equipment before final shipment to the installation site. Once on site, the cabinet simply needs to be placed and connected and it’s ready to go. All of the configuration and installation of the IT gear happened prior to shipment. We find that customer’s love the idea of these complete converged infrastructure solutions and there is a rise in popularity of these integration services. However, it presents a challenge in terms of shipment. A fully populated cabinet can weigh almost a ton and, being loaded with sensitive IT gear, cannot tolerate too much vibration and banging around on a truck. That’s where APC by Schneider Electric’s NetShelter SX with Shock Packaging comes in. While not new to the NetShelter SX product line, this year’s new enhancements address global market trends and the shipping concerns many integrators and Converged Infrastructure providers have brought to our attention. 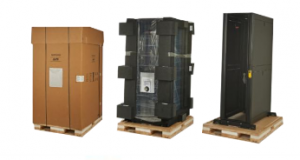 Now globally available the new shock packaging NetShelter SX cabinets support up to 2000lb of equipment installed in the cabinet and come in a larger range of sizes to accommodate even high density IT applications such as deep servers, wider cabinets of mixed IT gear (server, networking, and storage) and heights such as 45 & 48U for those sites with ceiling space to spare. NetShelter with Shock Packaging is user-friendly and has been designed with safety first and meets updated International Safety Transit Association (ISTA) standard ISTA3E. They are outfitted with heavy duty casters, two of them fixed for easy steering down ramps and across flooring, and a single piece wide ramp are enhancements to the product experience that have made it safe and easy to use. Keeping the customer at ease with the safety of their equipment the cabinet and packaging system has been designed with enhanced support of the equipment inside the cabinet. The cabinets equipment-mounting rails are bolted to the side braces of the cabinet and new pallet design with high density foam both limit the vibration and agitation during shipment. For reliability of delivery and appearances even under difficult shipping circumstances the easily removable and reusable foam inserts and outer wrap protect the exterior of the cabinet from side impact during transit and the rigorous travels that is freight shipment. With integrators in mind the packaging has been designed for easy removal and access to the cabinet for equipment installation while the cabinet remains on the pallet, once populated the packaging has been designed for easy reassembly. Now fully populated cabinets of IT equipment can be prepared for shipment in less time and with more confidence that precious IT gear is protected. All NetShelter SX with Shock Packaging are now rated up to 2000 lbs. New heavy-duty castors give better mobility for full cabinets so it’s easier to unload and place the rack for installation. To minimize the load on those castors during shipment, the new packaging includes brackets that assume the weight of the cabinet until it’s ready to be wheeled into place. With the trend towards Converged Infrastructure (CI) and single-source IT providers, simplified “rack and stack” is becoming more and more important to integrators, resellers, and IT providers. With NetShelter SX Shock Packaging, APC by Schneider Electric delivers a shipping solution that is easy, consistent and reliable. And because the re-assembly of the packaging is so easy, it saves time – which saves money. Follow @APCNetShelter on Twitter to learn about the new enhancements with Shock Packaging and other product line improvements that we will address in future posts such as energy saving white cabinets, and versatile, space-saving wall boxes. 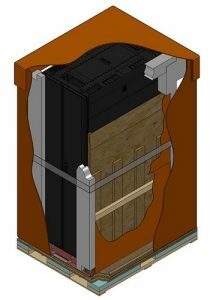 The new shock packaging is also an integral piece of the latest innovation from Schneider Electric to address computing with Micro Data Centers. Learn more about this new initiative and offer at www.schneider-electric.com/microdc.